New Hampshire Facts, New Hampshire Stastics, New Hampshire Wildlife, New Hampshire Government, New Hampshire Constitution, New Hampshire History, New Hampshire State Song. 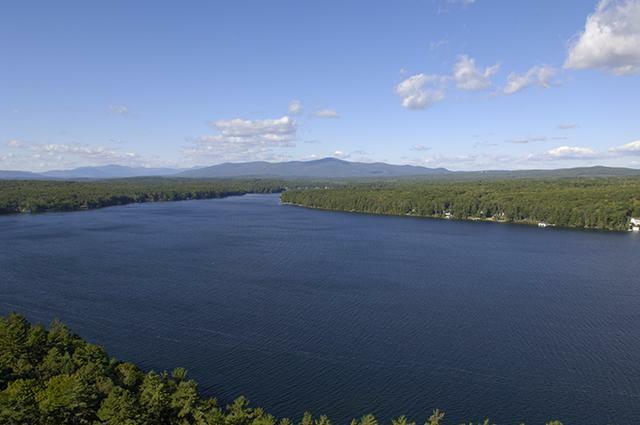 Welcome to your resource for New Hampshire Lakes Region, Central and Seacoast Real Estate. One of the New England states of the NE United States. It is bordered by Massachusetts, Vermont, with the Connecticut R. forming the boundary, the Canadian province of Quebec, and Maine and a short strip of the Atlantic Ocean. Area, 9,304 sq mi (24,097 sq km). Pop. (2000) 1,235,786, an 11.4% increase since the 1990 census. Motto, Live Free or Die. Year-round tourism is the state's leading industry. Many visitors come to enjoy the state's beaches, mountains, and lakes. The largest lake, Winnipesaukee, is dotted with 274 inhabitable islands, while along the Atlantic shore 18 mi (29 km) of curving beaches (many state-owned) attract vacationers. Of the rugged Isles of Shoals off the coast, three belong to New Hampshire. Originally fishing colonies, they are now used largely as summer residences. In the winter skiers flock northward, and the state has responded to the increasing popularity of winter sports by greatly expanding its facilities. When the snows melt, skiers are replaced by hikers, rafters, and climbers. Folk crafts such as wood carving, weaving, and pottery making have been revived to meet the tourist market. New Hampshire was named for the English Country of Hampshire. Because of its granite bedrock, New Hampshire has been nicknamed the "Granite State." Concord, our State Capital, was settled in 1727 and at that time called Penacook. In 1733 it was incorporated as Rumford. This name was changed to concord in 1765. State government moved to Concord in 1808 after residing in Portsmouth for more than half a century. The State House was built in 1819 and remains the oldest state house in the nation which a Legislature continues to meet in its original chambers. The State emblem is an elliptical panel with a picture of the Old Man of the Mountains. Surrounding the Old Man are General Stark's famous words, "Live Free or Die," adopted as the state motto in 1945. The State flag consists of the State seal centered on a field of blue and surrounded by a wreath of laurel leaves interspersed with nine stars. It was adopted in 1909. The central design of the State seal is a depiction of the frigate Raleigh resting on the stocks in Portsmouth, recalling New Hampshire's rich history of shipbuilding. The red-spotted newt, Notophthalmus v. viridescenus, was made the state amphibian in 1985. The whitetail deer, Odocoileus virginianus, was made the state animal in 1983. The purple finch, Carpodacus Purpureus Purpureus, was made the state bird in 1957. Purple finches prefer to live in open woods and swamps where firs and cedars are numerous. Often, however, they choose to establish their homes in the vicinity of our homes, especially if ornamental junipers or other conifers are nearby. Their summer range extends from the eastern province of Canada, southward through the eastern United States to northern New Jersey, Pennsylvania and westward to North Dakota. They spend their winter months in southern New England southward to the Gulf Coast. As do all members of the finch family, purple finches have cone-shaped bills, adapted particularly to eating seeds. Insects and the buds of fruit trees are also eaten. The adult males are attractively colored, while immature males resemble the drabber-appearing females. These finches are from 5-1/2 to 6-1/2 inches in length. The four to six dull greenish-blue eggs spotted with shades of brown, black and lilac are laid in a frail open-type nest of grass, rootlets, and bark strips. These nests are generally lined with hair and are often found in conifers. The purple lilac, Syringa vulgaris, was made the state flower in 1919. The purple lilac is an old English flower which bloomed over cottages and in the meadows of Runnymede. It was loved by Shakespeare and the other poets, and when stern patriots sought a new home, they brought with them this friendly bush and planted it at their first homes in southern New England. One hundred and fifty years later, the pioneers took it north and once more planted it in the wilderness by log homes in many a clearing. It has seen many changes in New Hampshire. The pioneers are gone and the early homes they surrounded are gone, but the lilac remains in thousands of backyards and fields where it greets the spring year after year. The pink lady's slipper, Cypriepedium acavle, was made the state wild flower in 1991. Smoky Quartz was made the state gem in 1985. The lady bug, Adalia bipunctata, was made the state insect in 1977. Beryl was made the state mineral in 1985. Granite was made the state rock in 1985. The white birch, Betula papyrifera, was made the state tree in 1947. The White Birch is a large, handsom tree growing from fifty to seventy feet tall. The leaves are deep green, oval, pointed and sharply toothed. The flowers appear in April or May in the form of drooping catkins about one inch long. The wood is hard, pale brown, very close grained and is used for schools, wood pulp, fuel and the making of small items such as mop handles. The delicate beauty of its white bark is striking against the green forest. The bark separates freely into many paper thin layers from the white on the outside to orange in the inner layers. It is tough, resinous, durable and waterproof. The Birch was widely used in colonial times by the Indians and early settlers. The inner bark was ground into a meal and the sap was made into syrup. The white bark was used for roofing wilderness huts, making writing paper, pots and pans, spoons, baskets and boxes. The Indians also usedthe material in the making of their canoes. Area 9,304 square miles; 86 percent covered by forest; population 1,109,252 in 1991; 17.75 miles of seacoast; 182 mountains and peaks with elevations of more than 3,000 feet, including Mt. Washington which at 6,288 feet is the highest peak in the northeastern United States; 1,300 lakes and ponds; 40,000 miles of streams and rivers. New Hampshire's matural beauty is complemented with an abundance of wildlife. game animals and fur bearers include: whitetail deer, cottontail rabbit and assorted hare, gray squirrel, mink, skunk, weasel, muskrat, red and gray fox, black bear, wildcat or bay lynx, Canadian lynx, porcupine, pine marten, fisher and pennant marten, elk, moose and beaver. Game birds include: ruffed grouse, pheasants, woodcock, and black golden-eye and wood duck. Among the game fish are: brook, rainbow and brown trout, landlocked salmon, lake trout, small and large- mouth bass, pickerel, whitefish, cusk, white and yellow perch and Sunapee or golden (Aureolus) trout. New Hampshire has the unusual distinction of having nine state songs, with one of them being "official" and the others "honorary." This came about by legislative votes over a quarter of a century, and was finally agreed upon in the 1977 session. Back in 1949, the Legislature adopted "Old New Hampshire" as the official state song. It was written in 1926, with the music by Maurice Hoffman, Jr., organist of the Franklin Street Congregational Church in Manchester, and the words by Dr. John F. Holmes of that city. The 1941 Legislature turned down this song, and the 1943 Legislature killed a bill proposed by Rep. Samuel P. Philbrook of Belmont, for a $1,500 public contest to pick a state song, with a $500 prize for the music and $300 for the words, along with $700 for a team of judges and related expenses. The 1963 Legislature approved a "Second State Song." It was "New Hampshire, My New Hampshire," by Julius Richelson and Walter P. Smith of Plymouth. Then the 1973 Legislature added a "Third State Song." It was "New Hampshire Hills," with the music by Tom Powers of Detroit, Michigan, son of retired Director Edward Powers of the State Sweepstakes Commission, and the late Paul S. Maurer, state poet laureate. The 1977 Legislature voted two unusual song laws. Early in March it adopted a "Fourth State Song." It was "Autumn in New Hampshire," by Leo Austin of Warner. At the same time the legislators created an interim board to recommend one official state song, with the label "honorary" for each of the others. Rep. Richardson D. Benton of Chester, chairman of the House Committee on Public Protection and Veterans Affairs, became coordinator of a State Song Selection Board. Appointed by the Governor and Council were William E. Elwell of Portsmouth, who became chairman, and Ted Hebert and Robert F. Thibeault of Manchester, along with Senator Robert F. Bossie of Manchester, named by the Senate President, and Rep. Jane F. Sanders of Alton Bay, named by the House Speaker. Three months after this Board was launched, the Legislature enacted another song law, effective June 15. This statute added four more songs to the listing of state songs, with a proviso that if the Board did not designate any of this quartet as the official state song, they would become "honorary." The Board heard and considereda total of 21 songs, all submitted by New Hampshire residents. Announcement of the name of the official song was made in Representatives Hall on November 29, 1977, when Mrs. Gale Thomson, wife of Governor Meldrim Thomson, Jr., drew the choice from a sealed envelope in which the name had been placed by the Board. The four additional state songs were "New Hampshire’s Granite State" by Annie B. Currier of Londonderry; "Oh, New Hampshire (You’re My Home)" by Brownie McIntosh of Hampton; "The Old Man Of The Mountain" by Paul Belanger of Berlin, and "The New Hampshire State March" by Rene Richards of Nashua. Coordinator Benton officially reported that the Board had voted to give the exclusive title of the official state song to the original state song of "Old New Hampshire," and this action is officially recorded as a footnote to the law creating eight state songs, in New Hampshire’s Revised Statutes Annotated. Of New Hampshire's Granite Hills. Whence her crystal waters break. » The White Mountains of New Hampshire can be seen in clear weather from ships off the Maine coast, some 80 miles away. In 1614, Captain John Smith reported seeing their peaks from the sea while on a voyage of exploration for the Plymouth Company. » Unlike the founders of the Plymouth colony and the Puritans of Massachusetts Bay, the first settlers of New Hampshire were commercial venturers who hoped to become wealthy by developing with England trade in furs and salted fish and saleable timber. » By royol edict, the provincial goverment of New Hampshire reserved the fimest tall pine trees with trunks more than two feet in diameter for use as masts by the English Navy. » Although New Hampshire was a stronghold of revolutionary patriotism, no British army ever invaded the Granite State. » In 1680, more than half a century after its first settlers arrived from England, New Hampshire comprised only five towns: Dover, Portsmouth, Exeter, Hampton and Nashua, and had a total population of less than 3,000. » New Castle, chartered in 1693, was the first town created by the provincial goverment of New Hampshire. Originally a part of Portsmouth known as Great Island, it was one of the earliest settlements to have a church and a fort. » More than half of the American troops who faced the British regulars at the Battle of Bunker Hill on June 17, 1775 were volunteers from New Hampshire under the leadership of John Stark. » Silver and glassware were costly rarities in New Hampshire households during the first 100 years of the colony's history. As late as 1730, even well-to-do merchants used pewter in their dining rooms, while poorer families drank from cups made of horn or leather. Kitchen utensils were often home-made of wood. » The first 74-gun line of battle ship ordered by the Continental Congress for the new American Navy was the "American," designed and built by Janes Hackett in Porthsmouth, New Hampshire. Although an experienced shipbuilder, Hackett had never seen 74 in his life. The "American" was launched in 1777, but wartime delays in her construction kept her from seeing service during the Revolution. She was finally given to the French government as a gesture of American gratitude for Frances's help in defeating Great Britain. » Samuel Morse, famed as the Father of Electric Telegraphy, was also a gifted painter. Three oil portraits of prominent Concord, New Hampshire residents, which he painted in 1816, are now located at the New Hampshire Historical Society in Concord. » Between 1820 and 1823, the amount of private capital subscribed to build factories in New Hampshire increased from about $2.5 million to more than $8 million, or roughly 230 percent. » Moses Gerrish Harmer of Boscawen, New Hampshire, was a little known pioneer in developing the use of electricity for lighting. In 1859, he lit a room with two bulbs powered by a wet-cell battery, and 10 years later he succeeded in illuminating his entire house with a with 40 light bulbs supplied with current from a self-exciting generator. » The first newspaper in the United States wholly devoted to summer resort information was The White Mountain Echo, established in Bethlehem, New Hampshire in 1878. An illustrated weekly, it was published for twelve weeks during the tourist season and contained a directory of visitors at all nearby White Mountain Hostelries. » Lewis Downing, whose Concord coaches were New Hampshire's best known product a century ago, is said to have inspected personally every vehicle that left his shop. Concord coaches not only helped to open the west, but improved transportation in Mexico, Canada, South Africa and Australia between 1850 and 1900. » In 1900 the greatest cotton mills in the world were those of the Amoskeag Manufacturing Company located in Manchester, New Hampshire. » Our State boast a number of firsts, among them being: the first state to declare its independence form England 1775; the first to form a free constitutional government with a legislature in 1776; the first to create a constitutional convention of, for and by the people; and the first to adopt its own constitution in 1783. » New Hampshire was the ninth and decding state to ratify the United States Constiution making it the "State that made the Nation." ©2007 WWW.REINNH.COM Each RE/MAX Office Is Independently Owned And Operated. All rights reserved. © 2007 Northern New England Real Estate Network, Inc. All rights reserved. This information is deemed reliable but not guaranteed. The data relating to real estate for sale on this web site comes in part from the IDX Program of NNEREN. Subject to errors, omissions, prior sale, change or withdrawal without notice. The agency referenced may or may not be the listing agency for the property listings displayed on this website.